The 2006 State of the Strait Conference examined the status and trends of key indicators for the Detroit River and Western Lake Erie. It was held on December 5th, 2006 at the Flat Rock Community Centre in Flat Rock, Michigan. To learn more about key indicators for Detroit River and Western Lake Erie, please visit The Detroit River-Western Lake Erie indicator Project sub-site. 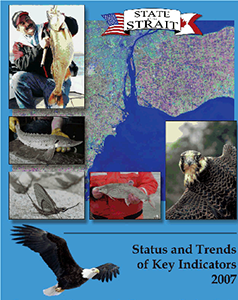 Status and Trends of Key Indicators 2007 is based on the Detroit River-Western Lake Erie Indicator Project. This document describes the major conclusions and recommendations from this three-year U.S.-Canada assessment, based on 50 indicators/trend data summaries that were discussed at the 2006 State of the Strait Conference held in Flat Rock, Michigan on December 5th, 2006. Below is a list of the presentations made at the 2006 State of the Strait meeting. Where available, you can click on the title link of a presentation to download a PDF version of the slides that accompanied the talk.